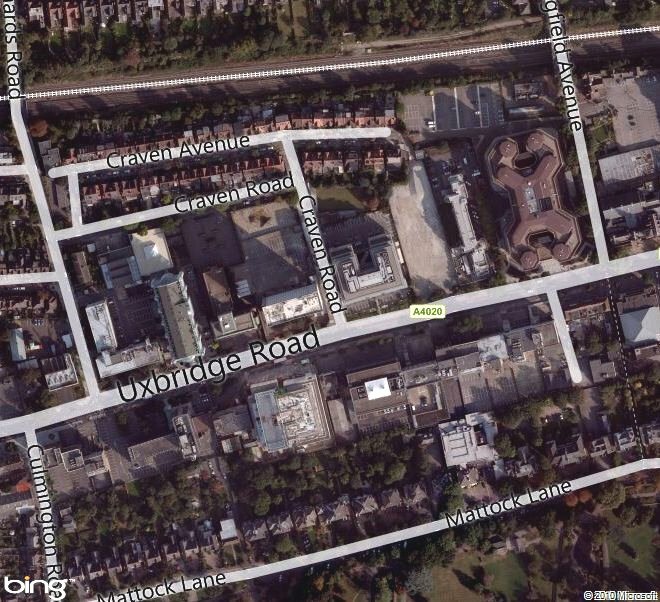 The "office corridor" is the stretch of the Uxbridge Road between the Ealing Broadway and West Ealing, between Longfield Avenue at the Town Hall and St Leonards Road/Culmington Road by the fire station. It is also known as the "boulevard" or "business/office quarter" in Ealing Council's development plan, where it is designated as an area for the majority of office space in Ealing. The area was developed during the 1960s with offices that replaced the Victorian and Edwardian houses that originally lined this section of Uxbridge Road. 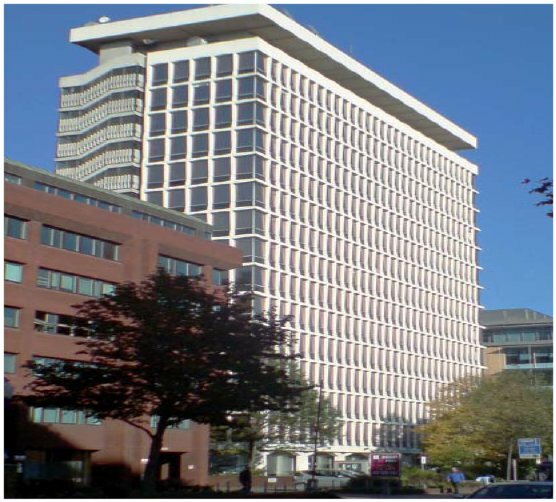 It mainly consists of purpose-built blocks of varying heights, of which the most prominent is the vacant 15 storey Westel House, designed by Richard Seifert of Centrepoint fame. Non-office buildings include Longfield House which is mainly flats and Cavalier House which was converted to flats a few years ago. A new Travelodge has opened and work has started at 22-24 Uxbridge Road, for which planning permission was granted in 2008 for a hotel and data centre. The office corridor is over 400 metres or at least ten minutes walk from the station. This distance discourages workers from commuting by public transport, and is inconvenient for business visitors arriving by tube or train. Offices in the corridor do not therefore benefit from the town centre's greatest strength - its accessibility by public transport. There is substantial capacity for extra rail travel to Ealing Broadway, especially inwards travel at peak times. This capacity will be further enhanced with Crossrail. While the office corridor is well served by buses running east-west, most buses running in a more north-south direction don't go along the Uxbridge Road but terminate at Haven Green. This necessitates a change of bus or a longer walk than to more centrally located offices. Car travel to offices has to be discouraged rather than increased, as any more growth would add to the present heavy congestion on the approach roads to central Ealing at peak commuting times, as well as adding to local air pollution. SEC believes that the relatively poor accessibility of the office corridor has contributed to its high vacancy levels. If new offices were to be located at more central sites there could be further conversions of existing buildings in the corridor into flats or for use for educational purposes, especially tertiary education and training centres. There would also be a market for good quality student accommodation to support these uses. Commercial development in Ealing, and the office corridor in particular, is a key element in the revitalisation of the town centre. The success or failure of Ealing's Local Development Framework rests heavily on whether the redevelopment plan for the area has correctly identified the future of the stretch that runs along the Uxbridge Road between the Ealing Broadway and West Ealing town centres. Those organisations that need to be in Ealing because local people have to visit them or because include Ealing Council, the police service, parts of the NHS, solicitors, the Job Centre and some social housing organisations. All but the NHS have offices in the office corridor. The centre of Ealing is a reasonably good location for these functions as it has the best transport links to other parts of the borough. However, those living in Southall or Northolt have a bit of a trek to get there. Those organisations that could be located elsewhere but choose to be in Ealing. This could be for a variety of reasons, including their founders living locally, cheap and available office space at the time, convenience for both central London and Heathrow, or general attractiveness of the locality. A significant proportion of the office space in Ealing is currently unoccupied. This includes Villiers House and Crystal House in the town centre. In the office corridor, Westel House is completely empty, Ealing Cross is largely unoccupied, and a number of the other blocks have spare space in them. Much of the empty space pre-dates the recession. Although some blocks may have been deliberately left vacant to enable redevelopment plans to come to fruition, this has been a situation for some time and casts a blight on the prosperity of the whole area.